Dave Noon at the Edge of the American West noted the photo above, showing one of the modern “Tea Party” demonstrations which have nothing to do with the issues of the actual Boston Tea Party. And the quotation on that sign has nothing to do with the actual Thomas Jefferson. In fact, that quotation, or one of its many variations, has usually been attributed to the British politician Edmund Burke, as Martin Porter examined in these online essays. He found many, many versions of this statement. He didn’t find any versions in Burke’s actual writings. The most common version, “The only thing necessary for the triumph of evil is for good men to do nothing,” appears in the 1968 edition of Bartlett’s Familiar Quotations, attributed to a letter from Burke that doesn’t exist. The editor of the next edition guessed that it might be a corruption of a separate statement from Burke that says something quite different—leading one to wonder what “quotation” is supposed to mean. Burke once said: “The only thing necessary for the triumph of evil is that good men should do nothing.” Leave the Drink Trade alone and it will throttle all that is good in a nation’s life. Let it alone, that is all that is required. Cowardice will suffice for its triumph. Courage will suffice for its overthrow. The patriotism of the good citizen must be as sleepless as the selfishness of the Liquor Trade. Eternal vigilance is the price of liberty. Moving a little earlier, the Archive of Americana tossed out an article in the San Jose Mercury Herald for 31 Oct 1916: “It has been said that for evil men to accomplish their purpose it is only necessary that good men should do nothing.” The man who delivered that line was another Prohibition advocate, Dr. Charles F. Aked. It is the common fate of the indolent to see their rights become a prey to the active.—The condition upon which God hath given liberty to man is eternal vigilance; which condition if he break, servitude is at once the consequence of his crime and the punishment of his guilt. I just wondered that if our founders thought taxation without representation was bad, what would they think of representation WITH taxation? Thanks for that link. I’d heard about this almost unbelievably fatuous remark, but thought it might be an urban legend. 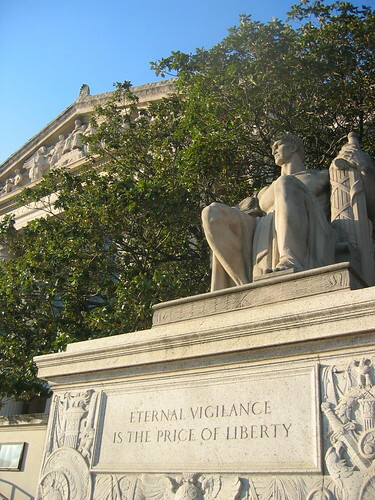 "Eternal vigilance is the price of liberty" is on the base of one of the statues flanking the entrance to the National Archives in Washington. It appears without attribution, though it would be interesting to see if any official publications about the building and its history attribute the saying to Jefferson (or someone else). I haven’t found any statement on the National Archives’ own website attributing that quote to anyone. But a “.gov” search turned up a couple of speeches of politicians misattributing the words to Thomas Jefferson, and one official—Comptroller General David M. Walker in 2001—attributing them correctly to Wendell Phillips. Speaking of dubious attributions, the flag shown in the photo is presumably a replica of the supposed "Sons of Liberty flag" in the Bostonian Society. As we learned from Whitney Smith's presentation at the Society a while back, the historical connection between the flag and the SOL is tenuous at best. Aked (an interesting man) was English, like Hyslop, or at least had been a clergyman in London before moving on to New York and California. Their "early" use of the quotation suggests a British origin, perhaps. I just noticed that the cloth in that photograph has eight red and eight white stripes, unless we count the white band on the right as merely a border. So it doesn’t exactly match any of the supposedly early American flags that modern tax-protesters have used. Maybe it’s not really a flag at all. This tax-protest movement has indeed tried to adopt the “Sons of Liberty” banner. Which, as Peter Ansoff notes, is quite dubious, given the nature of the cloth, historic sources, and its provenance. I also note that the “tea party” movement, flag and all, antedates the current administration by at least a year. But that webpage’s owner didn’t see the difference between the “Sons of Liberty” banner (nine stripes) and the “first Continental Navy jack” (thirteen).